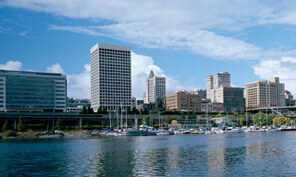 Bankruptcy court location in Tacoma, WA. IN ORDER TO ENTER THE TACOMA BANKRUPTCY COURT, A PHOTO ID IS REQUIRED TO PASS THROUGH SECURITY AND ENTER. Find the Tacoma / Pierce County Bankruptcy Court (They're the same). To find the Tacoma bankruptcy court, take the Tacoma City Center exit (133) from I-5 and go north on I-705 past the Tacoma Dome. Take the 21st Street exit left (west) onto 21st Street and turn right (north) onto Pacific Avenue. The Tacoma and Pierce County bankruptcy court is located a short four blocks north at 1717 Pacific Avenue in the historic Union Station between the Washington State History Museum and the Tacoma Art Museum, and across Pacific Avenue from the University of Washington at Tacoma. Parking at the Tacoma bankruptcy court is limited but free parking is sometimes available across the street on the west side of Pacific Avenue. You can also find public pay parking lots, which are located south and east of the Washington State History Museum and north of the Pierce County bankruptcy court. These can be accessed from either Pacific Avenue south of the Washington State History Museum or from Hood Street north of the Tacoma Art Museum. What kind of security can I expect? As you might expect, security measures have increased at all federal courthouses, including Union Station bankruptcy court in Tacoma, WA. Please be prepared to show your photo ID and pass through the security checkpoint, which includes a metal detector.